Here’s a diagram illustration I did for an inspirational article about how we should make smart decisions. The article was presenting ways great leaders take decisions. So I made a diagram representing the pieces of advice on smart decision making. Adding the illustration to blog article makes the core text more eye-catching and remembered. 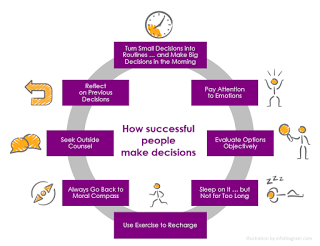 The source article is here: How Successful People Make Smart Decisions, written by Dr. Travis Bradberry, co-author of book Emotional Intelligence 2.0. Because the article contained an unordered list of equal value items, I applied a simple list type diagram. I chose a central circle to create a compact diagram look. Finally, I designed two proposals, one in a modern flat infographics style – this one is more heavy graphics with high contrast squares. Such a style is good if the infographics should overtake the reader attention. Another proposal is a light one, using unique hand-drawn scribble shapes and symbols – a central circle and only icons. This version fits better if you want the infographics to be only an addition to the article. Such blog illustration will add a personal touch to the article. I added various icon images representing emotions, time, exercise … to all items, not to have only the text labels. The goal is to create a visual association with each point. PS. Interested in similar illustrations? Drop me a line (via the contact page or my twitter).